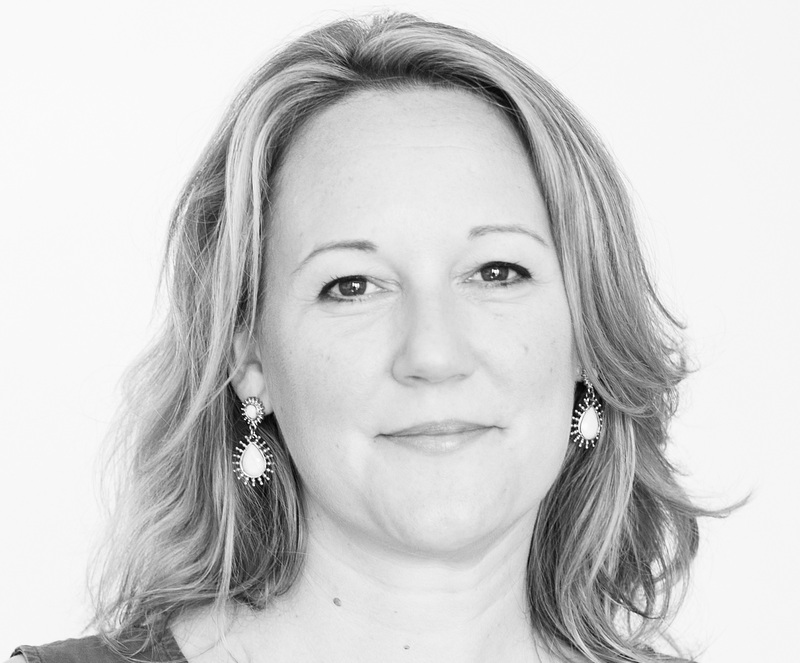 Katya Borowski is a fundraising and communications professional based in the UK. Editor’s Note: This post is the second in a new series highlighting cause marketing campaigns from around the world called ‘Global Voices’. We hope our team of international contributors will shed insights into cause marketing in their home country and inspire you to expand your own purpose-driven horizons. The British charity Age UK estimates there will be around 25,000 preventable deaths amongst older people this winter, due to health issues caused by the cold. According to the charity, 36% of people aged 60+ in Britain live in just one heated room of their home during the winter months because they are worried about fuel costs. Age UK’s Spread the Warmth campaign works through a network of local partners to distribute warm clothes, heaters and electric blankets; distributes information to those at most at risk of serious ill health or death and runs events to help tackle isolation during the winter months. 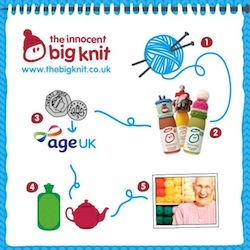 Originally conceived in 2003, The Big Knit is Age UK’s partnership with Innocent Drinks. Running throughout the autumn, it raises funds through the sale of a limited edition product range, which features smoothie bottles topped by individual woolly hats, which are knitted by the general public. Participation is encouraged with hat patterns provided online or for the less craft-minded, through the donation of virtual hats on social media. A number of volunteer-led events happen across the country to get people knitting. Such events can also provide a social way to involve older people in local communities. 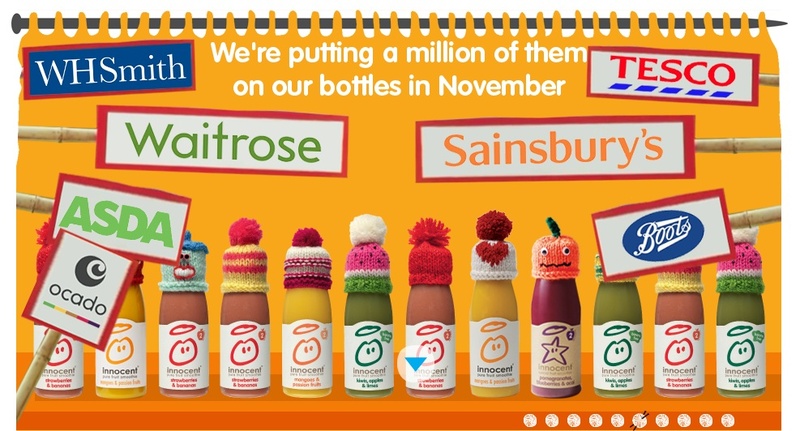 One million bottles will be distributed through major supermarket chains from November 2013 and 25p (around $.40) from every purchase will be donated to Age UK. For every virtual hat shared on Facebook or Twitter, Innocent will donate a further 10p (around $.16) up to a maximum of 10,000 shares. The campaign has raised £1.3m to date (just over $2mm) and £115,000 in 2012 ($183k). 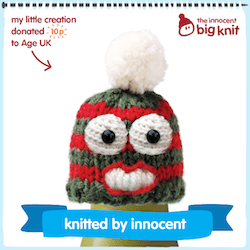 The Big Knit enjoys high profile seasonal on-pack promotions, a dedicated web presence and exposure to Innocent’s 357,000 Facebook fans; 156,000 Twitter followers and 23,000 Instagram followers. The longevity of the campaign attests to its enduring popularity and provides a stand-out example of how to get customers actively involved in a cause-led campaign. It brings focus to a complex issue which might otherwise be ‘out of sight’ for a younger audience and benefits from Innocent’s distinctive tone of voice – which is warm, upbeat and personal, enabling the charity to reach an affluent demographic in an engaging and relevant way. The community engagement aspect could perhaps be further maximized. There appear to be a number of Facebook groups themed around the Big Knit and local events seem to run on a reactive basis, rather than as a cohesive part of the initiative. Through supported activities in local communities, in workplaces and in partnership with civic groups, the campaign could in turn deliver enhanced communications about the issues at play, increase community fundraising revenue as well as greater social benefits for older people.